EBig thanks to the Polo Community in Harare for inviting Healing with Horses Zimbabwe to their International Tournament at Thorn Park Polo Grounds in Harare. This exciting tournament provided a huge stage for our participant, Fanwell, and his family, who came to lead the parade which opened the tournament on Saturday afternoon. 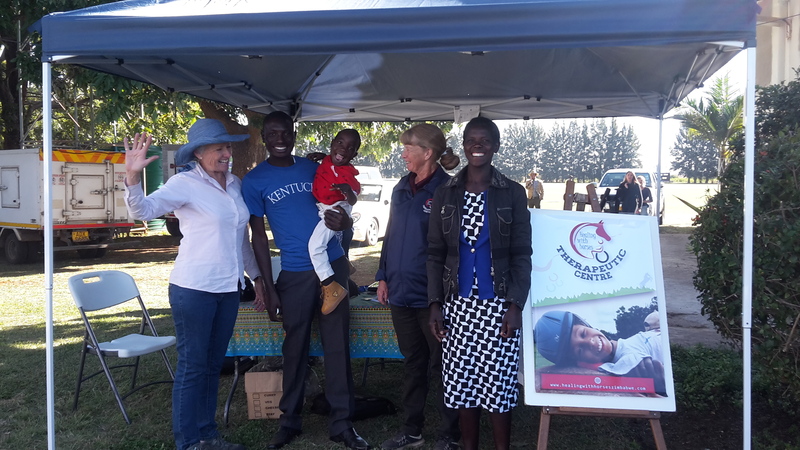 Thanks to our Harare representative, Trish Lillie, for all the work she put into our stand at the polo tournament, and to Fanwell and his parents for being with us on this day. How exciting it must have been for Fanwell to lead the procession of beautiful ponies who took part in the International Match between Zimbabwe and South Africa. These ponies and their grooms and riders must have worked hard to get fit for this match, and they looked stunning galloping up and down the field, such magnificent animals, so noble and beautiful, playing their hearts out for the riders. Of course, Nicky, Fanwell’s mount for the parade, looked just as stunning, and she has years of experience under her belt as a top jumping, dressage and gymkhana pony, as well known in the horsey community as Healing with Horses’s Harare representative, Trish Lillie. These two veterans of the horsey world in Zimbabwe are proud now, to serve the children in Zimbabwe with disabilities and special needs. Thanks must also go to the sponsors of this tournament, Titan Law, it was a well organised and fun event. Traveling to Harare provided Aileen and I the opportunity to accept the hospitality of Trish, and to stay in her wonderful home where we were entertained by all her animals. It was wonderful to see the Harare home of Healing with Horses, thank you Trish for making us so welcome. Anyone wanting to participate or volunteer at Healing with Horses in Harare, or who would like to become a part of the special Healing with Horses family by donating, please contact Trish, +263774044805, or Aileen, +263 773 472 225 to find out how, or e mail healingwithhorseszimbabwe@gmail. com.